If a fire occurred in your home tonight, would your family get out safely? A home fire-escape plan may save your family's life. Install smoke alarms on each floor of your home. Test them regularly. Draw a floor plan of your home showing all possible exits from each room. 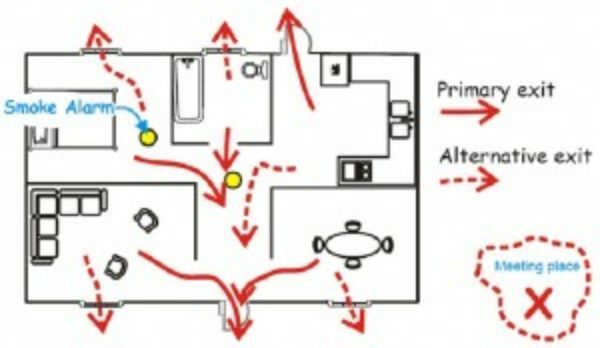 Plan a main exit route and an alternate exit route from each room. Ensure that everyone understands that if they hear the smoke alarm or hear someone shout “fire,” they should evacuate immediately. Decide on a meeting place. Someone should phone the fire department (9-1-1). Meet the firefighters when they arrive so they know that you are safe. Make certain that everyone in your home knows not to re-enter a burning building. Firefighters are properly equipped and trained to perform rescue operations – you are not. Practice your escape plan with fire drills. Regular practice is the best way to help prevent panic when an actual emergency occurs. Be sure that every member of the family knows what to do. A properly installed and maintained smoke alarm usually provides enough warning to enable you to leave your home safely. Before opening any door, feel it. Do not open a hot door, but use an alternate exit instead. Smoke and heat rise; breathable cool air stays low down. Practice your escape plan by crawling on your hands and knees. If you live in an apartment building, your escape plan should take the building-management procedures into account. If there is anyone in your home who needs help to evacuate, assign someone to assist. Make sure your babysitter understands your fire-escape plan.